E.O. Wilson wants to finish what Carl Linnaeus started 300 years ago: cataloguing and naming all of Earth’s species. But we’re only 20% of the way there, and he warns that if we fail to put half of Earth in nature preserves we will doom species — known and unknown. Our era, he says, could be remembered more for destroying Earth’s biological diversity than for technological advances. 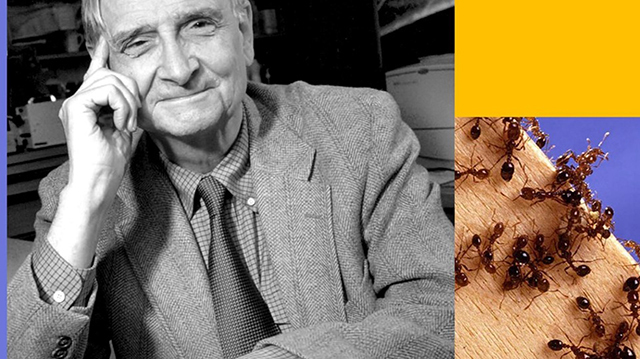 Wilson – whose expertise is ants – has become the planet’s conscience when it comes to biodiversity. In the early 1960s, he and his colleague Robert MacArthur mathematically described how islands could maintain a greater number of diverse species. That idea was the foundation for more exact planning of nature reserves, which he describes as islands in a sea of land, that are now a tenet of global conservation efforts. I talked with Wilson about his idea to preserve half of Earth, whether biotechnology can save the planet’s biodiversity and more. Excerpts from the interview are below. Right now, the percent of land put aside in reserves worldwide is approximately 15% and the percent of sea preserve is somewhere around 3-5% We need to take measures to move that to 50%. Recent studies have shown if we were to set aside the open sea as a worldwide reserve, that’s just about 50% of marine water worldwide. If we had 50% of the marine waters which are open sea preserved and fishing stopped, the production of the fisheries would rise considerably worldwide. In other words, the best way to raise fisheries’ production worldwide to produce more food for people in the sea, is to prevent any more fishing in the open seas. What are you going to do with the people in those reserves? That comes up a little bit, but oddly, that hasn’t been seen as much of a problem to the conservation workers who do this with scientific input and imagine how this could be done. The reason that we’re not too worried about that is that you could create a reserve by selecting parts of the land that have both high diversity and relatively sparse human population. Only one fifth [of species] have been stopped in the slide down towards extinction. Four-fifths have been continuing in spite of all our efforts around the world. Just a little past 2 billion [species have been] given a scientific name, started by Linnaeus, the great Swedish biologist back in 1735. How many actually exist? Answer: roughly 10 billion. There’s an immense job ahead of us to do what I’ve been calling the Linnaean Renaissance. In other words, we need to finish the job that Linnaeus started of actually cataloging and taking account of all the species of organisms on Earth and ecosystems in which we live. Now, how fast are these species going into oblivion? The rate of extinction is estimated to be somewhere between 100 and 1,000 times what it was before the coming of humanity. It’s to the point where very roughly we could be down to half the species on Earth gone, extinct by the end of the century. We’ve neglected biodiversity studies and ecology to the point, with reference especially to ecosystems and species, that we’ve almost abandoned them. That’s a foolish mistake, because if species are going extinct at the rate we observe and then we project from vertebrate animals where we can actually make the measurements on down into the vast pool of species that are going extinct, from invertebrates and bacteria and algae and so on, that haven’t even been identified, much less characterized and looked after, then you can see what a hopeless situation it is to relax and get ready at some time in the future of reviving species that are going extinct. Now, let’s suppose we could actually cover not just the 2 billion species we know, but somehow get preserves and put aside the whole gene package of each one of the species both known to us and still unknown. If we went that route, then it would be notably hopeless in an entirely different way. That is, you truly have Humpty Dumpty to put together. How are you going to, without knowing what the species are and how they were put together when they were alive and in their ecosystem without knowing most of that? How are you going to put the ecosystems back together again? If you are looking at a particular species, like the passenger pigeon, that one has come up as possible for possible restoration, or the marsupial wolf of Australia, their ecosystems are gone in substantial part. The ones they lived in, we’re adapted to. How are you going to save them except maybe as a few curiosity specimens in a zoo or a botanical garden? That’s the basic flaw, aside from the fact that it would be monstrously expensive compared to actually saving them simply by increasing the size of our reserves and looking after them in their natural ecosystem. Once we get the science fully established – and we’re making good progress on that – then we can know what the political prescriptions should be. Then in making those and ensuring their acceptance and maintenance, we need moral precepts that are the common feature of international agreements. The absolute moral prohibition of genocide, for example, the wished for goals of free movement of people, of civil rights and so on – into that cluster we should be moving saving the rest of life.